A couple of weeks ago, the New York Times ran an article, Is Your Religion Your Financial Destiny?, which included the following infographic. As my friend, Dave, who shared the article with me, pointed out - the color isn't necessarily informative, but it is an interesting way of carrying the gridlines across the page and certainly makes the visual eye-catching. I find the data it shows so very interesting. Across the y-axis on the left, we see the percent of population with household income above $75K. The x-axis across the top shows percent that graduate from college. 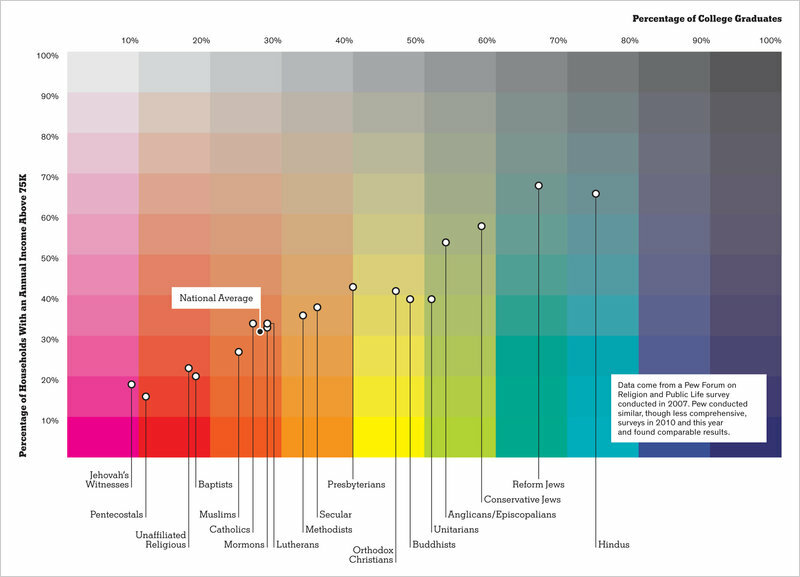 The dots plotted on the graph denote the various religions. You can quickly see that in general the higher the percent graduating from college, the higher the percent of >$75K income, which makes sense - one would expect positive correlation between education and income. As my eyes scroll over the graphic, taking in the information, a couple of things make an impression. First, the wide spread: less than 10% of Jehovah Witnesses graduate from college (many don't finish high school, according to my mother's empirical evidence from the small sample she knows from her neighborhood) and their incomes reflect this. On the other end of the spectrum, over 70% of Hindus have a college degree. Also interesting: the places where the dots across the page do not follow a monotonically increasing line. For example, a greater proportion of Buddhists graduate college than Presbyterians, however a smaller proportion of Buddhist households have income over $75K compared to Presbyterians. The same phenomenon exists between Reformed Jews and Hindus. The Times refers to these anomalies as "less affluent than they are educated" and points to cultural influences and possibly discrimination as the root cause. This isn't a case where the infographic is meant to highlight a single takeaway or recommendation; rather, it invites the audience to explore and draw their own conclusions: a tool for information discovery. Happy exploring!